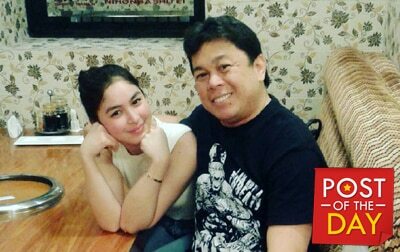 Julia Barretto spent some time with her dad Dennis Padilla. Julia Barretto spent some time with her dad Dennis Padilla. Dennis posted their photo on his Instagram account. He also posted their throwback pictures. In 2015, Dennis and Julia were embroiled in a legal battle regarding the latter wanted to drop her last name and use her mother’s surname. The actor eventually gave up and said he is allowing Julia to decide which family name she wants to use. The two reconciled their differences in May 2016. Julia, in a former interview stated that she’s happy things are getting better between her and her father. “As a daughter, it makes me really happy because at the end of the day, he’s still my dad. No matter what, gusto ko sa huli okay kami, walang hard feelings,” the teen star said.